Presidents Donald Trump and Vladimir Putin vowed a fresh start to troubled relations between the world's greatest nuclear powers at their first summit yesterday. 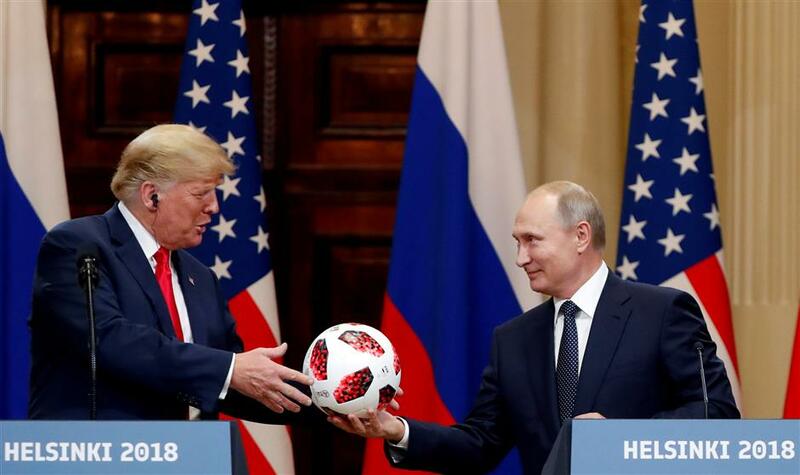 US President Donald Trump receives a football from Russian President Vladimir Putin as they hold a joint news conference after their meeting in Helsinki, Finland July 16, 2018. Presidents Donald Trump and Vladimir Putin vowed a fresh start to troubled relations between the world’s greatest nuclear powers at their first summit yesterday, as the American leader rejected a chance to condemn Moscow’s alleged manipulation of US elections. The US and Russian leaders came out of their meeting in Helsinki expressing a desire to cooperate on global challenges, after talks on an array of issues from Syria, Ukraine and China to trade tariffs and the size of their nuclear arsenals. Standing alongside Putin at a joint news conference, Trump said he had “spent a great deal of time talking about” election meddling, without going into detail or explicitly condemning any interference, after 12 Russian agents were indicted in the United States. Rather, when pressed about the verdict of his own intelligence chiefs, Trump stressed that Putin had delivered a “powerful” denial of any Russian vote meddling and said the US investigation by special counsel Robert Mueller had been a “disaster” for the US. The US leader, bent on forging a personal bond with the Kremlin chief despite the election allegations, went into the summit blaming the “stupidity” of his predecessors for plunging ties to their present low. The two leaders met one-on-one for more than two hours in the Finnish capital for the historic summit, with just their interpreters present, before they were joined by their national security teams. In a weekend interview with CBS News, Trump admitted that Russia remains a foe, but he put Moscow on a par with China and the European Union as economic and diplomatic rivals.